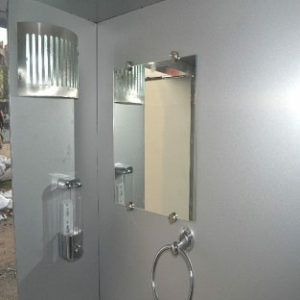 Executive Bio Toilet – Go Green Solutions Pvt. 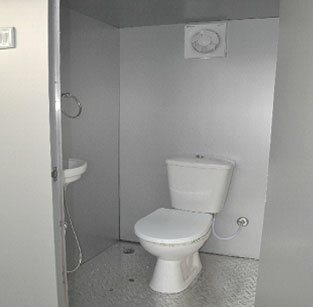 Ltd.
Aluminum Composite Toilet Cabin panel for structure single piece panels of Aluminum Composite of total size 3.5 ft. x 4 ft. x 7 ft. of total thick ness of 45mm sandwich structure i.e., 40mm thermocole covered with 3mm thickness Aluminum composites on both side. Door : single piece panels of Aluminum Composite of total size 2.5 ft. x 6.5 ft. of total thickness of 45mm sandwich structure i.e., 40mm thermocole covered with 3mm thickness Aluminum composites on both side. 2 nos. heavy duty hinges of size 160mmx65mmx8mm thick, & fittings having 1 no tower bolt, 1no locking bolt & 1no. Aluminum/steel handle. 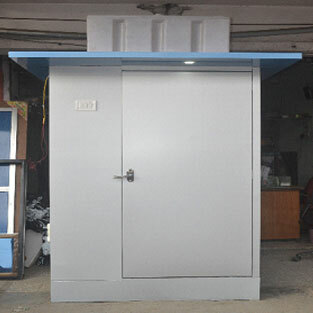 Cabin Roof: single piece panels of Aluminum Composite of total thick ness of 45mm sandwich structure i.e., 40mm thermocole covered with 3mm thickness Aluminum composites on both sides. Tools Jaguar make COMMODE and WASH BASIN, hand wash, Tissue paper stand, Tower hanger and mirror with proper Electrifications & water connections. 5) Over head water tank of 200 ltrs. with complete fittings. Water Tank Over head water tank of 200 ltrs. with complete fittings.